Harry Potter in the Forest of Sustainability: The New Book is "Green"
Are Harry, Hermione and Ron earth-friendly? The Rainforest Alliance says they are. Most of the 12 million copies of Harry Potter and the Deathly Hallows are printed on paper that is certified by the Forest Stewardship Council as coming from sustainably managed forests. This means that the paper originated in forests that are managed using socially and environmentally responsible methods. Most paper throughout the world is produced using practices that destroy habitat and exploit workers and communities. For example, paper companies often use trees from endangered old-growth forests that are disappearing. Other conventional sources of wood pulp include "tree-farms" that are chemically managed and almost devoid of wildlife. The first printing of the new book, the seventh and final installment in the Harry Potter story, used 16,700 tons of paper. Sixty-five percent of that was FSC-certified, making it the largest single purchase of FSC-certifed paper ever. In addition, about 30 percent of the paper was post-consumer waste fiber, another eco-friendly choice. "This is a major milestone for environmental and social responsibility in the publishing industry," said the executive director of the Rainforest Alliance, Tensie Whelan. "Using wood products from well-managed forests has a great global impact in conserving biodiversity and improving livelihoods in local communities. Read more about the Rainforest Alliance and FSC certification. The North Carolina legislature is on the verge of passing a "Clean Energy Bill" that started out green but is now an environmental travesty. The bill has had so many modifications tacked onto it that it now favors coal and nuclear energy far more than it does renewable sources. Duke Energy is clamoring for passage, because the bill has been retooled to heavily favor Duke Energy's financial profits. Legislators who are heavily invested in Duke Energy stocks are also strongly supportive of the bill (S3). Meanwhile, citizens who care about the future of the planet and about human health are desperately trying to put the skids on this bill before it is too late. The Charlotte Observer and the Raleigh News and Observer have both firmly stated their objections to bill S3.. State leaders must fix it or nix it. Call Governor Easley or House Speaker Joe Hackney (contact info below) to ask them to reject this bill; ask everyone you know to call. It's easy - you will most likely get a recording that will allow you to leave a message. Or you may get a secretary who will take a message. This bill would create a “cost-plus” gravy train for coal and nuclear power plant contractors, NOT the much needed transition to clean energy and lower greenhouse gases. EVEN WORSE, this bill leaves a gaping loophole that would allow the hog industry to undermine the years of work that have gone toward converting hog cesspools into cleaner technologies. The hog corps want the cheaper way out – capturing methane directly from the lagoons, selling it for energy, BUT LEAVING THE LAGOONS AND SPRAY FIELDS IN PLACE. This would relegate neighboring communities and our rivers to continued suffering from their horrible pollution. Scores of organizations are coming out against this huge corporate giveaway – advocates for health, social justice, the environment, seniors, consumers, low-income residents, river protection and conservative think tanks. · Provisions promoting new coal and nuclear plants are removed. · Full environmental protections at hog and poultry waste-to-energy plants are added. · Provisions allowing utilities to grossly overcharge for energy efficiency are removed. I went to South Africa hungry to learn about the conflicts between humans and wildlife on a continent with shrinking resources. Africa is a place of vast struggles, but it is also our most magnificent and diverse continent - with more cultures, more languages, more human history, and more varied and extreme habitats and wild animal creatures than any other continent on Earth. It is "the luminous continent," says Bob Geldof. And I might add, "the magical continent." It feels that way. It feels like an altogether different planet; a place that casts spells on people like me. If I drive 50 miles from my home here in NC, I will see squirrels and robins, I might see a chipmunk or an Eastern Cottontail. If I drove 50 miles from any point where I was in South Africa, I might see a giraffe, or a zebra. Or an elephant. I would hear more than one language I didn't understand, see clothing or everyday human inventions or customs that were completely new to me. Bedsprings used as a garden gate; a vendor selling air for tires or calls from a cell phone; marula nuts on my plate, which I had never heard of before. I marveled every time I saw a woman walking along the road with a parcel of fuel wood balanced on her head; when I saw a young child with a baby tied to her back. I was astounded at every single new thing; sometimes I was troubled as well, sometimes thrilled, but always astounded. But in addition to that, I was also on a mission. One of my self-imposed assignments was to talk to everyone I could find about the challenges to wildlife survival in Africa, and about the challenges that rural villagers face in a world of dwindling natural resources. On the subject of wildlife, I heard ten times more comments about elephants than about any other animal. We had the good fortune to talk to a number of rural villagers, particularly villagers in the area of Kruger National Park. "Elephants eat and trample our crops. They can tear up a whole field of corn in a few hours" said one of the villagers we talked to, a comment that was echoed by many other farming communities. Rural villagers in South Africa rely heavily on their corn crops for survival. Almost every lunch and dinner for rural indigenous people in northeastern South Africa consists primarily of "pap," a corn-meal dish that looks and tastes like thick corn grits. The pap might be eaten with a garnish of vitamin-rich herbs, or a bit of pumpkin, but pap from corn is the essential staple. It's good! We enjoyed pap on a couple of occasions, with a few mopani worms on the side for protein. The mopani worms we ate were boiled caterpillars, which were surprisingly tasty. These villagers work hard 24/7, raising all of their food and grinding their own corn into mealie-meal for the pap. Every family has chickens; some have a few goats and a couple of pigs as well. They build their own houses out of wood from the village commons, or increasingly, from bricks made of sand from the nearby river. They waste nothing. In the villages and all over South Africa we saw everyday items fashioned from things that could have been trash. Newspaper becomes wallpaper. A 2-liter pop bottle is the body of a toy truck; its wheels made of pop cans. Cast-off plastic bottles now tote water from the river, or hold liquid fuels for sale. In this world of resources stretched thin, an elephant foraging in village crop fields is bad, bad news. A ruined corn field is devastating to a village living on the edge of subsistence. But what is an elephant to do? All over sub-Saharan Africa, more and more land is converted to agriculture or other human endeavors. In South Africa, this may mean fields of staple crops, or it may mean huge tracks of sugar-cane owned by international corporations. Or tree farms of non-native tree species for the timber industry. We saw sugar cane and tree farms everywhere. A "tree farm" may sound "green" but it isn't. These huge chemically managed monocultures are useless to wildlife; they are deserts in terms of biodiversity. In Kenya, increasing amounts of land are converted to quarries, to produce stone for housing the increasing human population. Or farms that grow flowers to be sold in the U.S. and Europe. Farmers in both South Africa and Kenya increasingly fence their property to keep animals out, but the fences keep the animals confined to smaller and smaller pockets of land, unable to travel from one pocket to another as they forage or search for mates. How will the human-elephant conflict be resolved? I don't know. I do know that conservation efforts must include local people; everyone knows that now. Villagers must have some real incentive to protect wildlife, some incentive that improves their income or their livelihoods. The ecotourism industry is employing more and more rural people who actually live next to the parks and preserves - that is a strong and positive step forward. When elephants from preserves and national parks destroy crops, villagers must be compensated for their losses immediately. We heard villagers' complaints that they are not compensated, although they have been told that they will be. People living in villages next to national parks must also be included in government meetings that formulate wildlife policies; their opinions must be listened to. We were told by villagers that they do attend meetings, but their input is ignored. Elephants are not the only animals that have conflicts with human settlements. After elephants, lions drew more comments and complaints than any other we heard about on our trip. Lions sometimes kill livestock, just as wolves in parts of the western United States do. But more lions in a later post. I'm trying to pick up the threads of everyday life at home after a June trip to South Africa. Nothing seems quite the same. My husband and I went with another teacher; our purpose was to plan a student trip for the future. I knew the impact of Africa on my own psyche would be huge - I knew the continent would spin me around and spit me out a different person. It did. So much so that it's taken me two weeks to find some way to even start writing about it, to find a point of entry - some little angle that will allow me to begin to describe it. Elephants are a good place to start. Elephants are a source of heated controversy in South Africa. We met a lot of people who are either very angry about elephants, or very defensive of them. Much of this controversy is related to Kruger National Park, the flagship park of South Africa, a park almost twice as big as the state of Connecticut. Kruger is home to 12,000 to 14,000 elephants right now. It was easy for us to spot elephants there, even from the roads. We saw lone bulls, as well as small groups of mothers and babies. A male in musth (a hormonal state) almost ran me down (just outside the park) when I wandered off behind a clump of small acacias by myself one evening. I couldn't see him coming because of the bushes. My companions yelled to me - I stepped around the bushes and saw the bull with his long tusks trotting briskly right at me. I ran, and my companions yanked me back in the jeep with seconds to spare. That was definitely my own fault. Wandering through the bush on foot is not recommended, in or out of the park. It's strictly prohibited within the park. In fact, even sticking your head out of your car window can draw a stiff fine within the park. Although the thousands of elephants in and around the park make them easy to spot, many scientists believe that in the long run the park can support only about 7500 elephants. The problem with overpopulation, if the elephants in the park are indeed too numerous, is that these huge herbivores can be very destructive of habitat. They eat tree bark, among other things, and can easily rip a tree to shreds to get at the bark. In Swaziland (a tiny country surrounded by South Africa) we visited a park where almost all the trees were dead due to elephants' foraging. This Swazi park is fenced though - its elephants are unable to move outside the park, unable to cover the range of territory they would normally forage over. In the past, this roaming would have given damaged trees time to recover. But Kruger is much bigger than the Swaziland park, and most of Kruger has no fences around the perimeter. Most of the different areas and habitats we visited in Kruger showed no obvious evidence of elephant damage. The exception was near Shingwedze in the northern part of Kruger Park, where we saw big areas of torn up and dead trees. Besides habitat destruction, another problem with large numbers of elephants is that they leave Kruger (and other wildlife preserves) to forage on crops outside the park, which is a serious issue for rural villages that rely heavily on their crops for day-to-day subsistence. We spent a day in a rural village next to Kruger, hearing about their frustrations with elephants in their crops, something I'll write about in a later post. At the moment, SANParks (South Africa National Parks) is undecided what to do about the elephant issue. There's a lot of clamoring for them to cull the elephants of Kruger National Park in order to protect habitat for the other herbivores in the park. I think the cheapest and most likely method of culling is to shoot entire herds all at one go, from helicopters and the ground. Elephants live in protective family groups and are highly intelligent, so this would obviously be a traumatic and not very humane death for them, because it would take some time to kill one entire herd. This has been done in the past, and I've read that it's a very disturbing scene, not only for the elephants targeted, and for nearby elephants, but also for the shooters. Others have proposed darting the elephants with birth-control drugs, an option that would be extremely expensive. Many object to spending millions of dollars to deal with the elephant issue in this more humane way, when millions of people in South Africa are living in extreme poverty. Still others argue that the elephant population in Kruger National Park may very well regulate itself if we just wait. Some of the most knowledgeable scientists support this perspective, including Laurence Kruger, a biologist who conducts research in the park, whom we hired to help us design our student trip. I tend to believe Laurence, simply because he is a scientist who specializes in studying the impacts of elephants on habitat in Kruger, and he's a recognized expert on the subject. In July he attended a conference in Johannesburg on the issue of elephant management (to cull or not to cull), and is co-authoring a book based on the conference proceedings and current research. But....time will tell what the government and the SANParks officials decide to do. We'll stay tuned. The fact that elephants are numerous in Kruger National Park does not mean that elephants are flourishing everywhere. 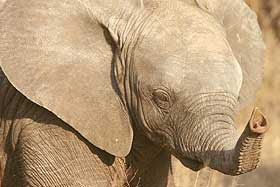 The number of African elephants crashed during the 1970s and 1980s due to uncontrolled slaughter and poaching for ivory. Then in 1989, the UN Convention on International Trade in Endangered Species (CITES) banned the international commercial ivory trade. This led to a reduction in poaching in some African countries, including South Africa. But the UN has no enforcement of the CITES treaty - the adoption and enforcement of the CITES agreement is up to each country's government. So poaching has continued unabated in many African countries, often due to nonexistent enforcement of the ban. Many countries lack the money to hire patrols to capture poachers - work which is highly dangerous. In June of 2007, African countries attended a meeting of CITES again and agreed (at least on paper) to a further 9-year suspension of ivory trading. But the meeting of the convention also agreed to allow four southern African countries to sell some of their stocked ivory through a permit system, including South Africa. This could give South Africa an incentive to cull the herds in Kruger National Park. Implementing best-practice standards for emergency international food aid will improve the quality, timeliness and appropriateness of food aid, says Daniel Maxwell, PhD at the Feinstein International Center, part of the Friedman School of Nutrition Science and Policy at Tufts University. “Analyzing food security in a more holistic way will allow us to broaden responses beyond just food,” he says. “An integrated information system that incorporates analysis of baseline vulnerabilities of households, monitors household trends, and considers alternative responses will provide for improved decision making when planning humanitarian relief efforts. “Since the famine in Sahel over 30 years ago, information systems have emphasized early warning before a crisis. This is important, but even if well-documented, early warning alone has proven inadequate to plan a response.” Maxwell stresses the importance of continual contextual monitoring and periodic program evaluation. He also highlights the need to separate information systems from operational budgets in order to maintain objectivity and impartiality about information gathered. In addition to improving information systems, better tools and methods are needed to plan aid responses that may include not only food, but may also include the provision of complementary resources, such as water or cash. New analytical tools not only track trends in food security, but also help to predict the consequences of interventions. “One of the potential negative consequences of poorly managed food aid is the impact of food aid on local markets,” says Maxwell. 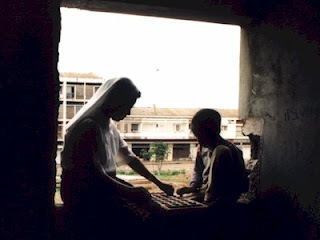 Maxwell acknowledges,”… It is often anything but a straightforward exercise to improve programming on the ground.” Despite the challenges, Maxwell maintains that adopting best-practice standards will help the humanitarian community to link food aid programs to broader interventions and policy changes, thus increasing the likelihood they will benefit individuals and communities in crisis, including over the longer term.